Samsung at today’s media event officially announced an eighth-generation Note with a water-resistant S Pen stylus, a narrower body, a dual-camera setup with optical image stabilization and 2x optical zoom (or 10x digital zoom) on both wide angle and telephoto lenses, a 6.3-inch (without accounting for the rounded corners) Quad HD+ Super AMOLED Infinity Display with an 18.5:9 aspect ratio that’s curved on the sides like on Galaxy S8 and more. The phone measures 162.5mm wide, 74.8mm deep and 8.6mm tall, weighing in at 195 grams. It features “glass sandwich” design held together buy a shiny aluminum frame and sports a nearly full-screen face without a physical Home button, like we saw with Galaxy S8. According to the South Korean conglomerate, the new Note has the default resolution of Full HD+, or 1,600-by-900 pixels, which can be changed to Quad HD+ (2,560-by-1,440) in Settings. “We appreciate the relentless passion of the Note community. 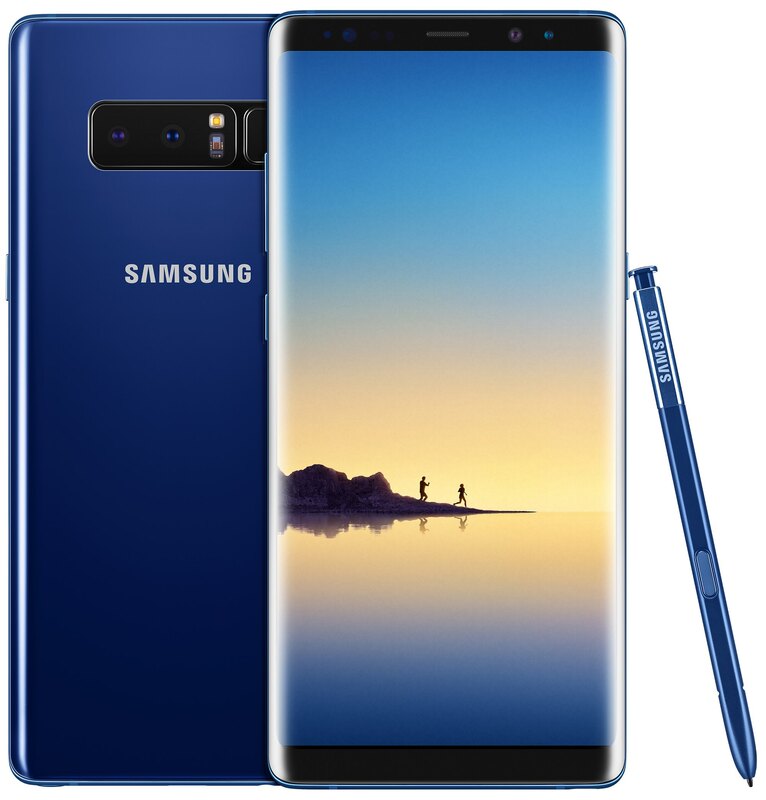 They’ve been a constant inspiration to us and we designed the new Note for them,” said DJ Koh, president of Mobile Communications Business, Samsung Electronics. It supports all the multitasking capabilities of its predecessor, while providing a brand new feature called App Pair which allows you to create a custom pair of apps on the screen edges. The new Note packs in a 3,300mAh cell. It supports wireless charging compatible with the WPC and PMA standards and has fast-charging compatible with QC 2.0. “Samsung continues to uphold its commitment to lead the industry in battery safety,” the company noted. “The Galaxy Note 8’s battery has undergone Samsung’s 8-Point Battery Safety Check procedure”, which it claims is the most rigorous in the industry. As for the Note’s dual-lens camera, Samsung’s most powerful smartphone camera system yet, it has rapid auto focus and optical image stabilization on both the wide-angle (f/1.7 aperture) and telephoto (f/2.4 aperture) lenses, which results in better low-light photography and sharper pictures when using 2x optical zoom or taking depth-of-field photos. Apple’s iPhone 7 Plus lacks optical image stabilization on the telephoto camera. Samsung has another feature not implemented by Apple: the ability to control the depth of field by adjusting the bokeh effect in preview mode and even after you take the photo. In dual capture mode, both rear cameras can even take two pictures simultaneously—one close-up shot from the telephoto lens and one wide-angle shot that shows the entire background—and you can save them both at one in the Camera roll. As for the front shooter (f/1.7 aperture), it has eight megapixels and smart focus. The enhanced S Pen stylus sports a finer tip and improved pressure sensitivity with as many as 4,096 levels of pressure (Apple Pencil is said to support 1,024 pressure levels). With it, users can create more expressive messages with animated texts or drawings in the form of animated GIFs, hover over text to quickly translate individual words and entire sentences in up to 71 languages or convert units and foreign currencies. Another feature, called Screen off Memo, lets you take up to 100 pages of notes as soon as you remove the S Pen, pin notes to the Always On display and make edits directly from it. Note 8 comes preloaded with Android 7.1.1 Nougat. In terms of biometrics, it supports iris scanning, facial recognition and fingerprint scanning. IP68 water and dust-resistant, the new Note is powered by Qualcomm’s Snapdragon 835 chip or a Samsung-made Exynos, depending on the market (both are fabricated on a ten-nanometer processor), and comes with six gigabytes of LPDDR4 RAM and 64GB onboard storage expandable to up to 256 gigabytes via a microSD slot. The 64-bit chip uses four cores clocked at 2.3 gigahertz when speed maters, switching to the four low-power 1.7 gigahertz CPU cores for non-critical tasks. Wireless capabilities include 802.11ac Wi-Fi, Bluetooth 5 and NFC. Yes, there’s even the standard 3.5mm headphone jack! Lastly, it does LTE Cat. 16, has USB Type-C and comes with Samsung’s Bixby assistant that speaks US English and Korean and supports features like translation and image search. Like Apple’s Siri, Bixby learns from you and improves over time. 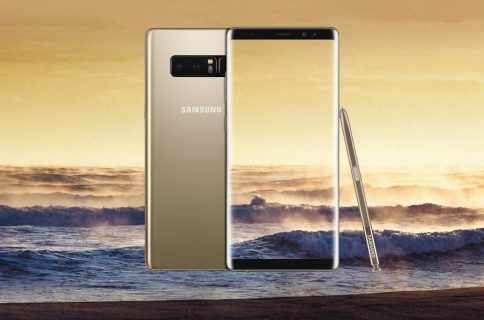 Note 8 will be available ahead of iPhone 8 starting September 15 in Midnight Black, Orchid Gray, Maple Gold and Deepsea Blue finishes. Pre-orders will be available from US carriers and retailers like Amazon, Best Buy and Walmart starting tomorrow, August 24. Verizon says Note 8 will cost $40 per month for 24 months, or $960 at retail. According to The Verge, the contract-free device will be priced at $930 at T-Mobile and $950 at AT&T. Samsung will treat its loyal Note 7 owners to a trade-in credit of up to $425 when upgrading to Note 8 through Samsung.com. Plus, those who buy a Note 8 between August 24 and September 24 have the chance to get either a free Samsung Gear 360 camera or a free Galaxy Foundation kit with a 128GB memory card and fast wireless charger. Watch the Unpacked 2017 presentation on YouTube (there’s even a 360-degree version).